Summary: Everyone knows a couple like Jack and Grace: he has looks and wealth, she has charm and elegance. You'd like to get to know Grace better. But it's difficult, because you realize Jack and Grace are never apart. Some might call this true love. Nobody is perfect. You never know what goes on behind closed doors. These are two sayings we hear all our lives but that have never been proven truer than within the pages of this book. For all appearances, Jack and Grace are the perfect couple with the perfect marriage. This is the perfect lie. When Grace met Jack, he seemed too good to be true. He was. Page after page reveals just how far from good Jack is. This was a book the subject matter of which was difficult to read at times, but nothing could tear me away until I knew how it ended. I have to say, the antagonist did not terrify me in the way I thought he might; it was the situation he placed the main character in that did. I had my moments of “Why don’t you just…” and “Can’t you try…” and “Just do this…” – but then she would, and then she’d try, and then she did. And it was all in vain. I think there’s a different kind of fight to put up when you have nothing to lose and when you have someone you’re fighting for. Because of Grace’s love for her little sister, her options were very limited. And speaking of her little sister, Millie was quite the scene-stealer and easily my favorite character. The clock is counting down and Grace knows she only has one chance left before her nightmare becomes someone else’s. 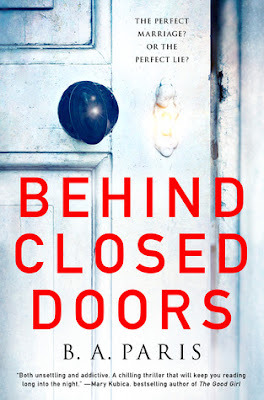 Behind Closed Doors was a fast read and an intriguing debut from B.A. Paris. Though it is being touted as the next *insert 2012’s best-selling thriller that shall not be named here* – as is every psychological thriller that has since followed it – this is not that book. It doesn’t need any comparison; it does just fine on its own. Creepy, thrilling, and will definitely have you side-eyeing your significant other! This book is popping up everywhere! After reading your review, I'm convinced I want to read this one. I am really curious now, I want to know what goes on behind those doors, and then I don't! I will add this for later as I still need to keep things light and easy right now. Yeah, it's easy to have reactions like that. This sounds like it was done really well, Michelle. So this showed up at my house randomly and I didnt give it much thought... but I guess I need to rethink that huh... this one sounds awesome Wifey. Great review! lol toally agree, I have heard that comparison a lot and it just doesn't hold up. I do think if you liked "that book" though that you would enjoy Behind Closed Doors. I really liked it- I don't usually read "scary" books - and I don't even know if this is supposed to be that scary, but for some reason it just really gave me the creeps, but I loved it! Oh my! Another book that sounds a bit creepy! Lovely review!